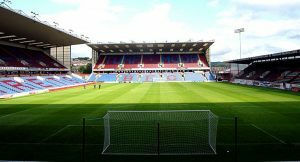 Burnley is a well-supported, friendly club with a good atmosphere. Swans fans are in the David Fishwick Stand behind the goal. The away stand has two pillars which can spoil your view and old, wooden seats instead of plastic ones. If the Swans take a big away following, the concourses below the stand can be a bit mental to get a drink. A variety of pies and hot dogs as well as lager, bitter & cider are available. Burnley is in the heart of Pennine Lancashire. It has historic houses and an industrial heritage, a working forge and a brewery. The South Pennines countryside is great for wildlife, walkers, horse riders and cyclists and there are plenty of waterways – canal, rivers, reservoirs and lakes. The panopticon high on the moors above Burnley has views over the town from Pendle Hill to Worsthorne Moor with Padiham and the surrounding villages in the distance. Burnley’s pub and club scene is pretty lively. Burnley Mechanics (BB11 1BH) is a renowned live music venue. For a week up until the 18th, Jekyll and Hyde is on with a pop-rock soundtrack, tickets are £16. Towneley Park is the largest park in Burnley at 180 hectares and has landscaped parkland surrounding Towneley Hall and Museum. It has an 18 hole golf course, a 9 hole golf course, a Pitch and putt course, woodlands, a café, playgrounds, bowling greens and an offshoots permaculture project. Hotels near the town centre or Turf Moor are Holiday Inn Express, Rosehill House Hotel, Premier Inn, and Oaks Hotel and Leisure Club. ‘Burnley Cricket Club’ (BB10 4BN) has a clubhouse right next to the ground and you can also park there for £6. The ‘110 Club’ (BB11 3BY) near the ground is a private club which lets in away fans for a small entrance fee. The club serves good reasonably priced food and cheap beer with children welcome. ‘The Bridge Bier Huis’ (BB11 1UH) is a 10 minutes walk from the ground, serves good beer, has a decent, varied food menu and is OK for away fans. ‘The Talbot Hotel’ (BB11 2RS) is a big pub in a 600-year-old stone-built building and has real ales, Sky Sports on big screens, 2 pool tables, an outdoor beer garden and live music. They have rooms (but no breakfast) at £30 for a single and £40 for a double. Near Burnley fire station you’ll find the ‘Queen Victoria’ (BB10 3EF) a Brewers Fayre pub. ‘The Woodman Inn (BB11 3EX) is half a mile up the road from the ground and is a small & friendly place for away fans, with a large screen TV showing sports. ‘The Turf Hotel’ on Yorkshire Street and pubs in the town centre are best avoided and colours should be covered up in and around the centre of town. There are two train stations close to Turf Moor, Burnley Central (local trains, a 20 min walk) and Burnley Manchester Road (trains from Manchester, a 15 min walk). Trains from Swansea take 6 hours and leave at 06:47 and 07:46 to Central, to Manchester Road they are at 06:47 and 07:46. The only train from Central to get you back to Swansea is the 17:48, getting in around midnight. Manchester Road is 17:15 and 18:14.